On 2011 June 18, Saturday morning, Bruce, Judy, Lance, and Mark worked. Vietnamese mint (#149), eggplant, and fennel (#37) (7 plants total). Appending to the plants at the east end, 2 crookneck summer squash were transplanted. Appending to the plants at the north end, 2 trombetta (#36) summer squash were transplanted. Interplanted with the melons were four rows of purple royal burgundy bean seed #185. 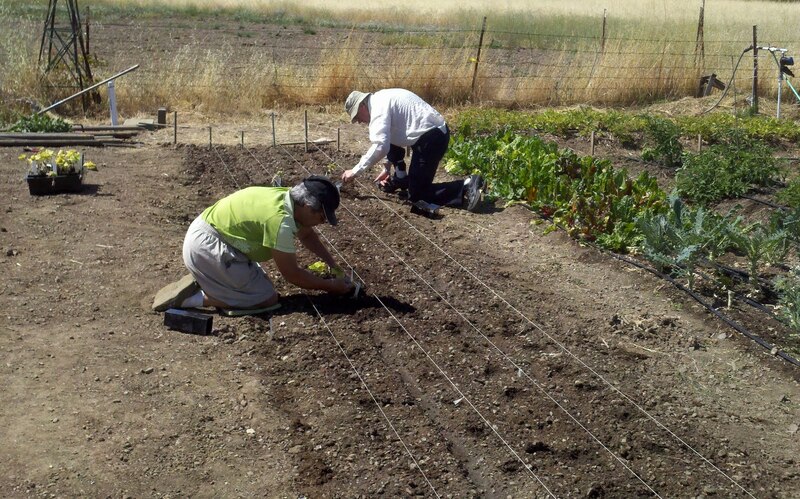 The rows were placed exactly between the T-tape runs, and seeds were spaced at approximately 2 inches in the row. In this bed, Charmant (#73) cabbages still remain in the W half, more than half harvested but roots still remaining…the Waltham Butternut were placed up against the cabbages. Kabocha were placed E of these, and then Crooknecks to the E end of the bed. Purple Royal Burgundy beans were interplanted exactly as in bed B4. All remaining Bull’s Blood Beets (#75) were harvested. Several were tiny, but a few, especially at the W end of the bed, were large-rooted. Within an hour after harvest, these beets were processed by pickling and canning. The result was exactly 6 quarts. These jars will be presented to OHK. After beets were removed, three hills of Golden Hubbard winter squash seeds (#131) were planted, centered in bed B6, with five feet separating the hills and five feet separating the end hills from the ends of the bed. Beans were not interplanted at this time. Prior to planting these seeds, the book “Golden Gate Gardening” by Pam Pierce was consulted…for the region including Walnut Creek, it was stated that mid-June was the last chance to plant winter squash so we are attempting it.